Shocked by the clinical efficiency with which Crimea rejoined Russia, the United States is planning to disband NATO and transfer control of its bases in Europe to a new military command directly under the Pentagon’s thumb. 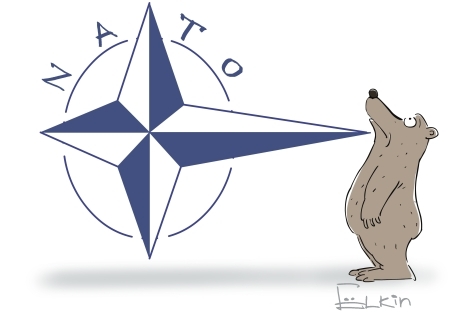 NATO’s inability to act in the face of the Russian military’s quick and bloodless integration of the Crimean peninsula was seen as a defining low in the 65-year old military organisation’s history. “We thought if we can’t protect our own guys in Ukraine, then what can we do?" General Patrick Varkrimnelle, Chairman of the Joint Chiefs of Staff, told USA Today. According to General McKilla, all the anti-American dictators are long gone. “Sure Kim Jong-un is still around and occasionally he threatens the West, but the North Koreans have nuclear weapons, so we can't flatten Kim like we did Muammar Gaddafi and Saddam Hussein,” he said. NATO’s military command will be transferred out of Brussels, the current headquarters, to a destination in North America. Canada will continue to be part of the new organization and NATO insiders say Mexico could be invited. “That will paint the entire continent a uniform shade of blue, providing some relief to the American right that is currently traumatised by the US military’s impotence against Russia,” said Robert Krauthammer, Director, Whitesuper Foundation, Mississippi. However, language studies are the least of NATO’s problems. Several East European member states are unhappy with the alliance’s exit and have threatened to lay siege to the NATO Secretariat in Brussels. “There’s no way we’ll allow the Americans to leave us to the mercy of the Russian bear,” said Estonian President Jan Schutzstaffel. Estonia is a key destination for renditions and interrogation of suspected terrorists apprehended by the US law enforcement agencies around the world. “We are very useful to America,” said Schutzstaffel, as he left to inaugurate the annual festivities marking the Nazi ‘liberation’ of his country in 1941. General Varkrimnelle remained unfazed and was extremely critical of Russia, saying that President Vladimir Putin had strayed from the script that had been followed for the past 20 years. "We were looking forward to landing our Ospreys in Crimea. But Putin just kicked us in the guts, I hate him," he said. Meanwhile in Moscow, a Kremlin insider said President Putin was mulling retirement now that the premier threat to Russia was leaving the continent. “There are many tigers to tranquilise and migratory birds to help, but all this geopolitical work is getting in the President’s way,” he said. And if you are still here and believe everything in this story, I have some prime real estate for sale in Antarctica.